Dr. Helen Scales, bottom right, poses with a slideshow of three of her books. Carrie Pinkard is a graduate student in the USF journalism department. This semester, she’s working as Science Journalism intern for the College of Marine Science. 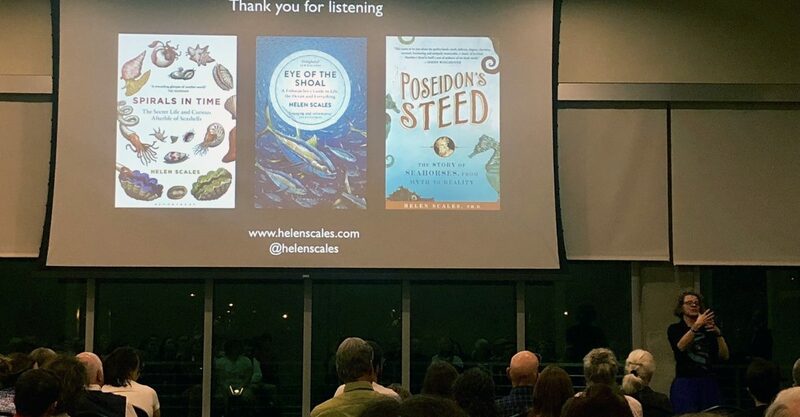 ST. PETERSBURG, FL – Dr. Helen Scales’ fascination with the ocean began when she was a child vacationing on the beaches of Cornwall in southwest England. Now, as a scientist and author of four books, she seeks to educate people on why our oceans are important. 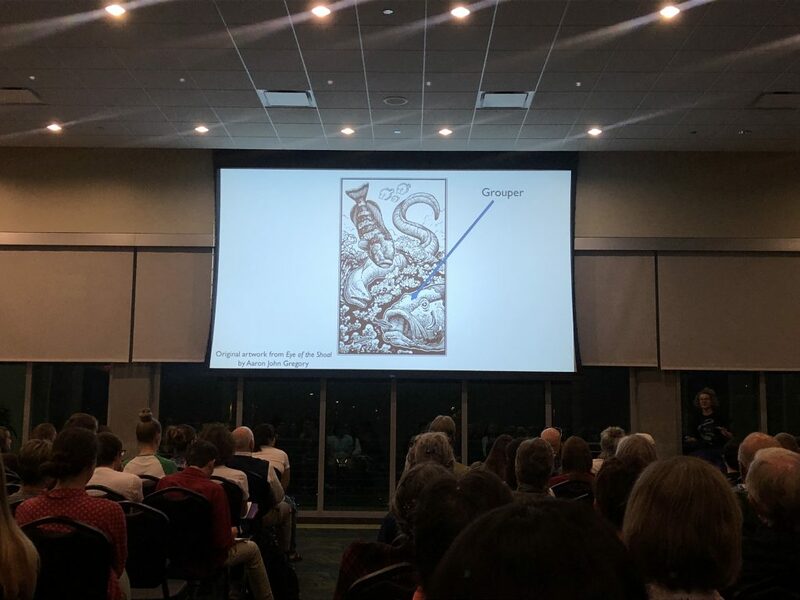 On Wednesday, February 6, 2019, students from the College of Marine Science met with Scales in a Q&A session that was followed by a public lecture on the USF St Petersburg campus titled, “Why Oceans Matter.” To illustrate why she believes oceans matter, she told the audience three stories. Each used a different ocean species to stimulate thought-provoking questions, and to teach the audience something about the ocean as a whole. The first story was about mollusks. “Mollusks are some of the oldest, most diverse and most successful species on the planet,” Scales said. Mollusks are creatures that live inside calcium carbonate shells. As they grow, the shell expands with them in a spiral pattern. Pictured: An animation of how a seashell expands to form a spiral shape. Scales pointed out that, although it may seem there are an infinite number of differently shaped seashells, they are all derived from just a few mathematical principles. “You can have these complex beautiful shapes emerging from simple ideas. 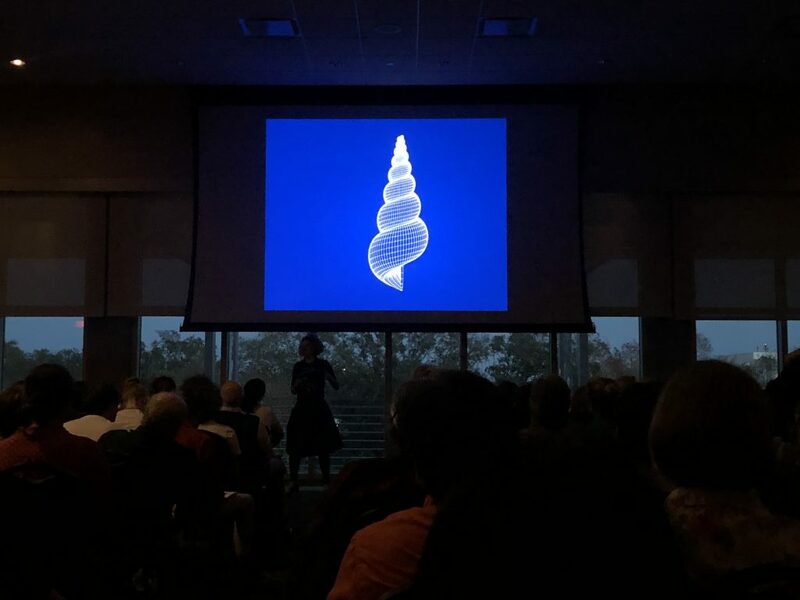 We can enjoy all these extraordinary shells from just a few mathematical rules,” she said. 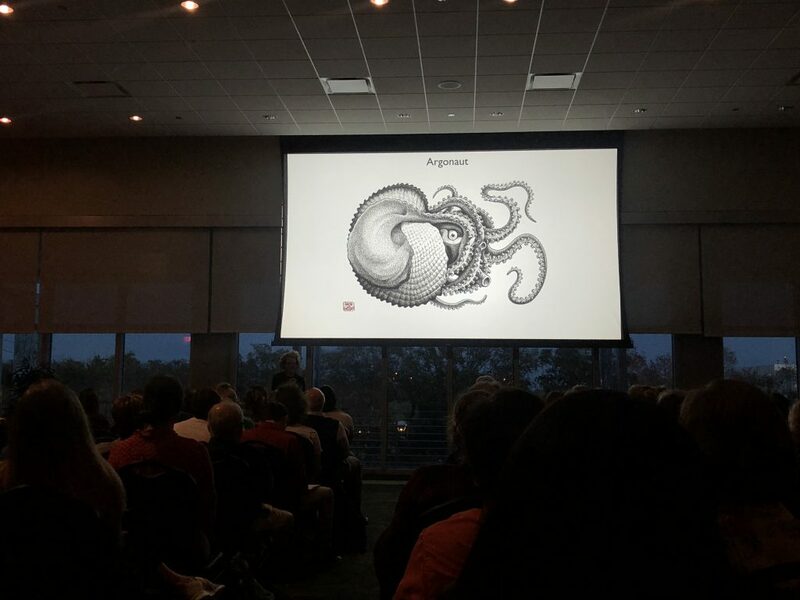 Next she described the history of the elusive argonaut, an unusual octopus that lives close to the sea surface. In the 19th century, sailors believed argonauts were thieving octopuses that stole shells and used them to float along the surface of the ocean. It was Jeanne Villepreux- Power, a scientist living in Sicily, who shattered this stereotype. She built a wooden box with slats in it that allowed seawater to flow in and out. Then, she took an argonaut out of its shell and placed in the box to see if it would leave the box to steal a shell from another creature, or if it would grow its own shell. When the argonaut did nothing, she put pieces of its shell on the bottom of the box. That’s when she learned the argonauts could fix their shell with a glue-like substance that they produce with two of their arms. Their craftsmanship isn’t the only unusual thing about argonauts. They also have an interesting mating system. Male argonauts are 1/12th the size of females and they carry a pack of sperm around in one of their arms, which they insert in the female when ready. After that the arm detaches and the male retreats to die. The female then carries the sperm around with her inside her shell until she’s ready to use it. “I just think the world is a better place knowing there are creatures like argonauts swimming in the ocean,” Scales said. Her third story was about a fish called a wrasse whose main profession is to clean parasites off of other fish. This vignette highlighted how one fish serves a distinct purpose in the ocean. Like humans, Scales said, the wrasse fish has a profession. It is a designated “cleaner.” Fish of all types come to the wrasse to rid themselves of parasites. The wrasse “knows” and remembers them all, said Scales, who took it even further, saying scientists also believe that the wrasse might even know itself. After showing the wrasse its own reflection in a mirror, it showed signs of self-awareness. Pictured: A grouper visits a wrasse fish to rid itself from parasites. Scales used this discovery to point out that the public perception of fish needs to change. If fish have self-awareness, what makes them so different from people?